We’ve just stayed in an AirBnB townhouse on holiday and there were a couple of features–specifically 2 very nice red deckchairs in the cute garden filled with cactus plants–that made me want to stay there. Of course, it helped that there were enough bedrooms for all of us, air con, the location was perfect (edge of town so you can park easily, but not so far away you’re worn out getting to everywhere) and, of course, WiFi. But when we arrived, the lovely deckchairs were no where to be seen. So for someone like me who books with their eyes (and I can’t be the only one), when I imagine myself reading my book in the garden on holiday it is, unsurprisingly, in those lovely red deckchairs. 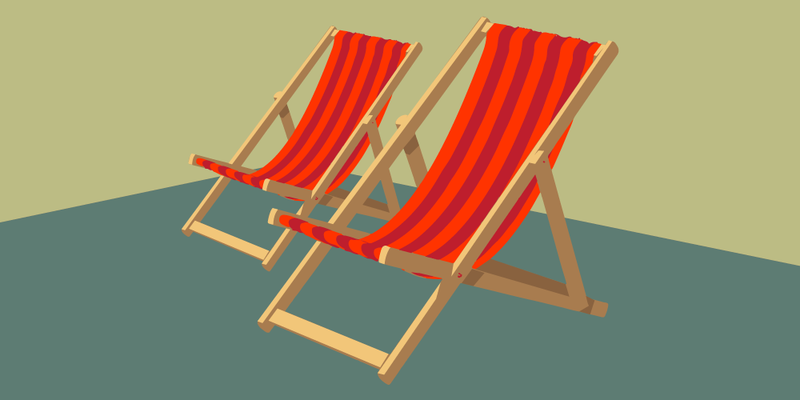 Now, I’m all for being OK substitutions–the deckchairs could be another colour or replaced with a different style of ‘relaxing seating’ and I’d have coped–but I wanted the deckchairs... and the deckchairs weren’t there. Of course I didn’t let the lack of 2 chairs ruin my holiday–there were perfectly nice other chairs around the outdoor table, and the sun was shining, so all was well. BUT it did make me think about advertising and misleading people by showing something that’s not really there. The flip side to this story is that, actually, the house had OTHER things we didn’t even know about (no photos of them or mention on the listing) which really added to its appeal! (You can also see now why I was more forgiving about the deckchairs). There was a whole extra room we didn’t know was there for a start (!). There was the ‘formal’ lounge and dining room, but also an extra lounge at the back of the house overlooking the garden–with a big squishy modern sofa (immediately commandeered by the small people, I might add). There was a cute ‘interior patio’–letting light in and providing some potted plant greenery. AND (and this is a big selling point for me as I’m a huge fan) a really big roof terrace with nice views. A roof terrace is a big draw for me as I love the quiet up on the rooftop... it had a great view of the mountains, and somewhere fab to see the sunrise and sunset. And there was literally no mention of this! So I may have lost out on my deckchairs (which the agent did ‘fess up to being ‘for the photos’ when I asked about them! ), but I gained another room, a patio and a roof terrace I had no idea about. Which is why I’m suggesting that you advertise what you’ve really got. Because who knows who is not booking that house thinking there’s no roof terrace or wanting a second lounge for small people to hang out in. And when I pointed all this out to agent they just didn’t realise any of the ‘extras’ would be a selling point. Because that’s like your Thing too–to the Spanish a roof terrace is simply somewhere to hang the washing, but to me it’s a little bit exotic. That is so true. I’m amazed when people rave about 100WC. I know it’s good but sometimes I almost get embarrassed. We don’t see what’s on the end of our nose that the world looks at every day! I ask myself, I ask my clients, and I ask (in my head!) this on behalf of people I see who are stuck, or afraid, or unsure. The reason I ask this question a lot is that sometimes there isn’t actually a ‘good’ reason to wait. There may well be an excuse (or lots of excuses) but very often, when it really comes down to it, there isn’t actually a real reason. When you need to get noticed for your Thing, this is when it’s about you. You need to tell your story and explain your ‘Why’ so that the people who need you and your Thing can find you. But you also need to make it about them.